The Pentagon is realizing that fighting in the frigid north may be more of a possibility than ever as Russia prepares its forces for sustained arctic operations. Now a handful of the US Army’s attack helicopters are getting optimized for this scenario, receiving skis, a pilot survival pod and being tested to see how they adapt to the extreme environment. The Apache’s permanent presence in Alaska is still a relatively new development. It came about as the result of the Army’s aviation reorganization plan that saw the sudden (and some would say boneheaded) demise of the OH-58D Kiowa Warrior armed scout helicopter fleet. 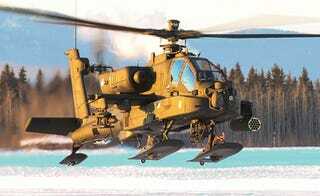 An enlarged and upgraded Apache force, along with unmanned aircraft, are taking their place, including in Alaska. The Army Times reports that 1st Attack Reconnaissance Battalion, 25th Aviation Regiment based out of Fort Wainwright, Alaska is the first Army Apache unit to permanently bolt on skis to their aircraft. They are now in the process of training on how to fly and fight with them attached, including developing procedures that will keep themselves from blasting the skies to pieces with their articulated 30mm cannon. Skis are nothing new when it comes to helicopters in Alaska, Army ones included. They distribute the weight of the helicopter over a much broader area than wheels or skids, and allow for aircraft to land on even marshy areas, known as muskeg, that could otherwise pose disaster for a helicopter. The skis are build by renowned purveyor of such apparatuses Airglas and weigh just 400 pounds in total. This added weight and drag is supposedly nearly unnoticeable for Apache pilots. The attack chopper’s wheels are still there, they just run through slots in the center of the skis. They let the Apache still taxi and work from prepared airfields and ramps as they normally would without skis. The 1st Attack Reconnaissance Battalion, 25th Aviation Regiment is also testing a crew survival pod that will hang on one of the Apache’s weapon stations. The pod provides an additional 13 cubic feet of space for Apache crews to use, which is just enough for the bare minimum cold-weather survival necessities. The unit is also really pushing the Apache to the extreme when it comes to climate testing, figuring out exactly what issues will be experienced by deep freezing the chopper and bringing it back to life for use. Ground crews executed an experiment where they placed wet Apaches in minus 10 and minus 20 degree temperatures to see how they would react to being exposed to such horrific conditions. During startup they found that the computers booted more slowly and that the leaks occurred in certain areas. Although the Army has operated Black Hawks, Chinooks and many other helicopters in Alaska over decades, the Apache is by far the most complex chopper sent up there. It was never really designed to operate in such extreme conditions over prolonged periods of time. With this in mind, finding out the weaknesses in the system now, instead of combat, is a high priority. It is unclear why the Apache was never was tested at the Pentagon’s climatic research laboratory, but maybe such a test is now in the helicopter’s future considering its new environment. An arctic-capable Apache is a good thing for the Pentagon, which is racing to catch up and adapt to Russia’s emerging hawkish foreign policy stance in regards to the arctic. As ice melts due to climate change, new shipping corridors will likely be established, and there are large untapped energy reserves in the region With this in mind, Russia seems to be is setting itself up to have control of it, a premise that the US and its allies are not too happy about. This story also invites debate as to how effective highly complex weapon systems would be fighting for a prolonged period of time in such an harsh environment. Would it be a better strategy to use simpler systems that are far more hardy but less capable? It’s an intriguing question, one that we will hopefully never have answered in battle.